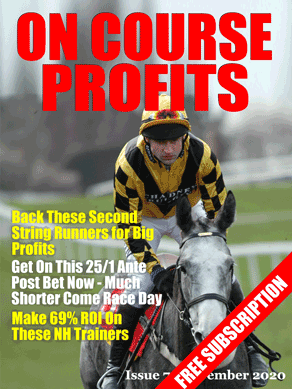 We had some good comments on yesterdays article which have promoted me to write a bit more about each way betting. The first comment that was interesting came from somebody who has just started working in a bookies. Dan says that each morning he gets a list of each way races on which they have to restrict bets to just £10 each way. This tells us two things. One is that there obviously value in these races if the bookmakers are telling their shops to restrict bets on these races. And two that this is the kind of bet that gets your accounts restricted. That's not to say that you shouldnt make these bets, just that you should think about spreading them around a few different accounts. The second comment that was of interest related to the Betfair place only markets. The thing is that the Betfair place only market is a free market, so the prices will reflect the true chance of a horse placing. So there is no value. The bookmakers price is determined by a set of rules that relate the price to the win price, that's why sometimes there is locked in value. Yesterday's selection was 1.31 in the Betfair place market. We were getting 2.6 (8/1 divided by 5) so even if we discarded the win part of the bet we were still left with 1.6 which was a value bet. All of this reminded me of another strategy that you could use and that is to lay off the bet. Let's say on yesterday's selection you bet £10 each way at the bookies at the early odds of 8/1. so what you have is a bet of £10 to win at 9.0 and a bet to place of £10 at 2.6. You could then lay off both bets at Betfair. The Betfair SP was 11.0 for the win and 1.31 for the place. But backing at 2.6 and laying at 1.31 gives a guaranteed profit of £10. So you place a £10 eachway bet and then with a few minutes work you guaranteed that you will get back £8.20 more than you staked, minus a little bit of commission if the horse doesnt win. That might not sound like much on it's own, but for the £20 staked it is a 41% return on the investment. The bottom line is that when you find these situations there is locked in value, when you have value you have options to make money.